Design beautiful and reliable model rockets using SpaceCAD. Assemble your rocket from a vast library of stock elements. 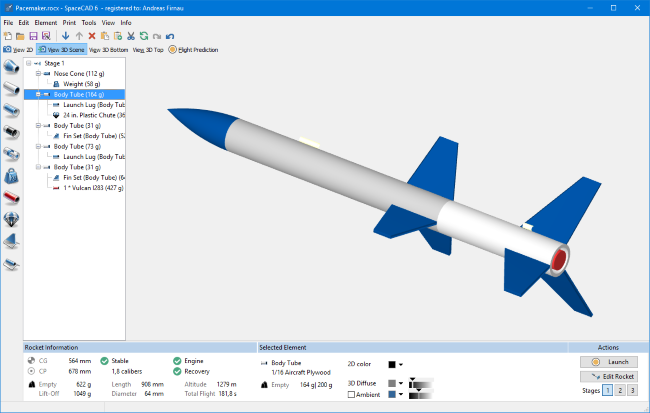 Build your rocket and make it real using SpaceCAD's building support tools . Export fins and centering rings as SVG files, build a transition from cardboard, see exactly where to drill the holes in centering rings. 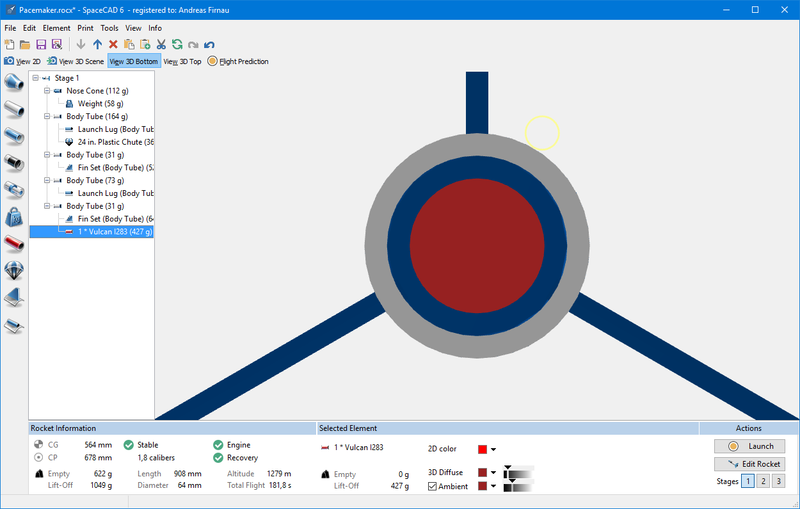 Fly your rocket by simulating multiple rocket flights in varying configurations. Simulate multiple rocket configurations, make sure that your rocket makes a perfect vertical flight, even in windy conditions. Rocket design doesn’t have to be rocket science. Easily assemble, preview and see how your finished rocket looks like. Jump start your rocket design with SpaceCAD's pre-designed rocket elements from Estes, Quest or Aerotech. SpaceCAD always shows your rocket's Center of Gravity (CG), Center of Pressure (CP), stability and weight. Quickly prototype your model rocket. Use SpaceCAD's drag & drop editor with full undo support. See the details of your model rocket design like the length of elements. See your rocket like it will look like once you have finished building it. Check the alignment of elements using the 3D top and bottom view of your rocket. Build your rocket from a vast library of elements: nose cones, tubes, transitions, launch lugs, rings and rocket engines. Easily add your own parts to the database for easy reuse. SpaceCAD tells you know all the time if your rocket will fly stable. It does that by computing your rocket's Center of Gravity (CG), Center of Pressure (CP), stability and weight. Build your rocket and see the details in technical 2D or realistic 3D. Easily zoom in to see all the details. Important data like lift- off weight and stability is always visible. SpaceCAD allows you to save your fins and centering rings as SVG files. You can use these to print them with a laser cutter with high precision and build your rocket faster. 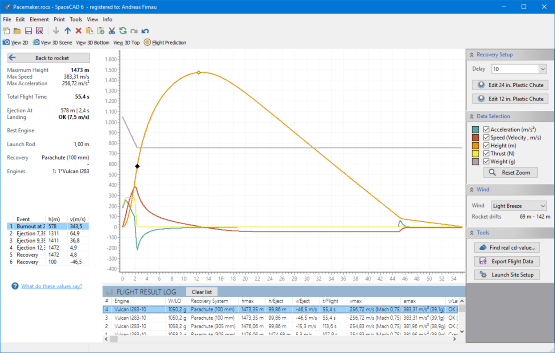 For competition rockets this software is FANTASTIC! Your product is simple and to the point. Anyone who is interested in rocketry should have this product. SpaceCAD is the perfect tool for model rocketeers! 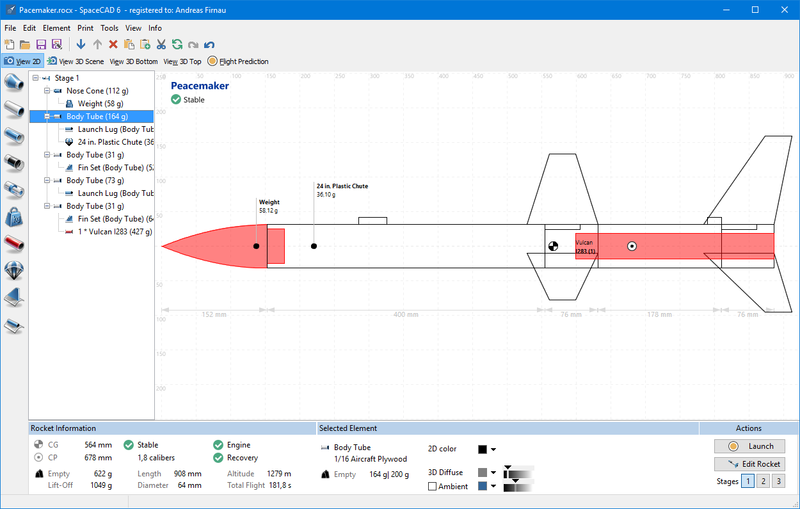 SpaceCAD’s flight prediction requires just one click and immediately displays the graph of your rocket's flight profile. It also shows all relevant flight events like engine burnout and motor ejection times. Find out how high your rocket will fly, the optimum engine delay, how fast your rocket will go and its maximum acceleration. See the float time and drift depending on wind speed, test multiple recovery systems to find out the best one for the current weather conditions. You can use multiple parachutes or streamers for an exact floating time, like required in the TARC contest. This allows you to fine tune your rocket’s flight for best performance & safety. Never lose a rocket to wind drift again. 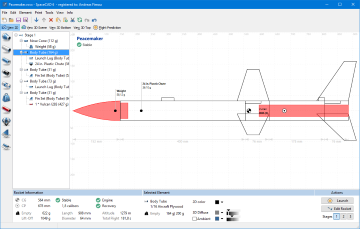 SpaceCAD tells you how your rocket flies before the actual rocket launch. Simulate multiple rocket configurations and make sure that your rocket makes a perfect vertical flight, even in windy conditions. SpaceCAD tells you instantly how long your rocket will take to land safely. It also allows you to analyze how far it will float. The recovery designer allows you to test multiple recovery systems to find out the best one for the current weather conditions. Simulate how your rocket flies at different launch sites - for example, if you're in Florida and want to prepare for the different conditions in Virginia. Enter launch site details for a more accurate flight prediction. - and helps you build your rocket faster and easier. 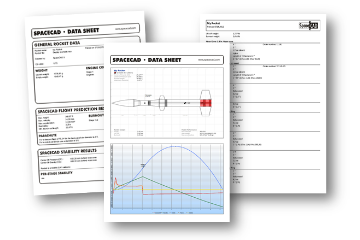 The rocket datasheet is the perfect companion on the range. Print a parts list that contains all elements of your rocket. 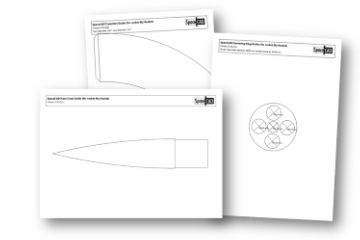 The fin-position/-alignment and cutout guides help you to cut your fins and align them perfectly on your finished rocket. 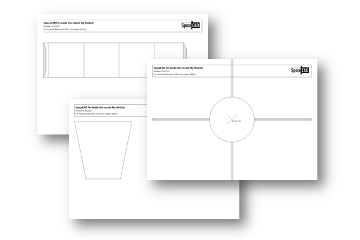 Templates for transition, nose cone or centering rings make building a lot easier. Use the parachute printer to build your own parachutes. 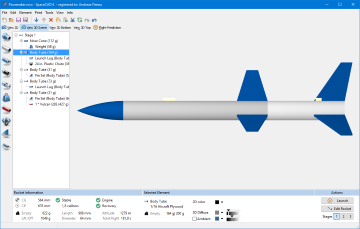 Model rocketry is a fantastic hobby - and you can make it even more fun with SpaceCAD! For Windows 10, Windows 7. 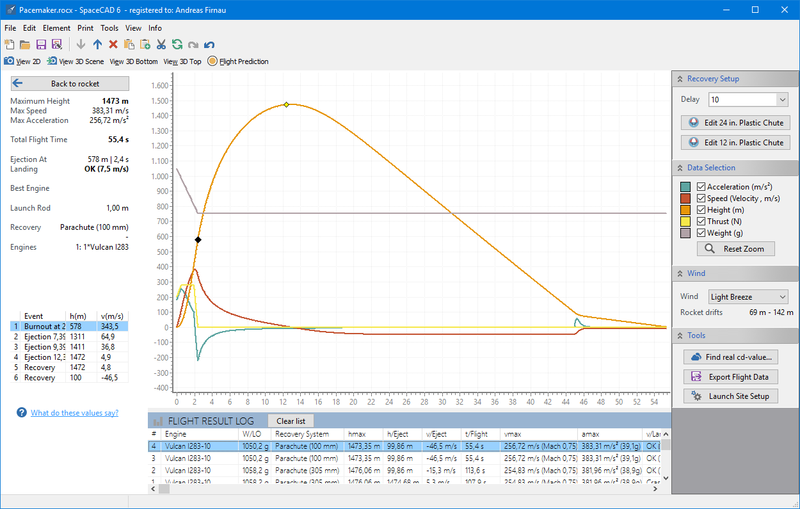 Build new and improve existing your model rockets, know their performance. Optimize your rocket's performance before building and launching it. Did you know that rocketry is a global hobby? SpaceCAD is used in more than 30 countries world wide. Schools use SpaceCAD as a valuable teaching tool and SpaceCAD is officially trusted by the world’s largest rocket competitions like the Team America Rocketry Challenge.